The American Silver Eagle was first released in 1986 as part of the American Eagle Bullion Program. This program was authorized by Congress in 1985 to produce gold and silver bullion coins with their weight, content, and purity guaranteed by the United States Government. 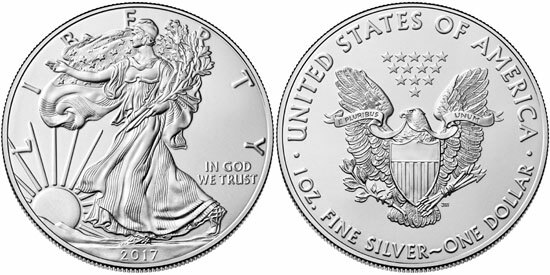 The design of the Silver Eagle is taken from the Walking Liberty Half Dollar. This coin was issued for circulation in the United States from 1916 to 1947. It was designed by Adolph A. Weinman and is considered to be one of the most beautiful US coin designs ever created. The reverse of the coin, featuring a heraldic eagle, was designed by John Mercanti specifically for the series. 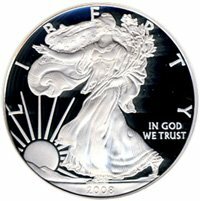 American Silver Eagle bullion coins are not sold directly to the public. Instead, the United States Mint distributes the coins through a network of authorized purchasers. These dealers purchase the coins in bulk quantities and then resell them to other bullion dealers, coin dealers, and the public. Authorized purchasers are also required to create a two way market with the public, both buying and selling the coins to ensure liquidity. Silver Eagles can be purchased through several options. Bulk purchases can be made by buying so-called “Monster Boxes.” These green boxes contain 25 rolls containing 20 coins each, amounting to a total of 500 troy ounces of silver. Since a large number of coins are purchased, this option usually yields the lowest premium. More commonly, coins are purchased by the roll. These rolls have a distinctive green top which includes the seal of the United States Treasury. Of course, the coins can also be purchased individually, but this generally results in the largest premium. From the beginning of the series, American Silver Eagles have drawn the attention of not only bullion investors but also coin collectors. The coins are often viewed as the modern equivalent of Silver Dollars, since they are struck in silver and carry a $1 face value. Coin collectors can assemble the complete series by obtaining one coin for each date and adding to the collection with each new release. Some collectors assemble sets of coins which are encapsulated and graded by third party grading companies such as PCGS or NGC. The top graded coins typically command significant premiums above intrinsic value. The United States Mint has also produced different versions of the coin specifically for coin collectors. From 1986 to present, the Mint has produced and offered Proof Silver Eagles. These coins are struck with specially prepared dies to create sharp features, mirror like backgrounds, and frosted design elements. From 2006 to present, the US Mint also produced a collectible uncirculated version, struck on specially burnished blanks and carrying the “W” mint mark. Other special versions of the coin have been offered to coincide with the 10th, 20th, and 25th anniversaries of the program. To celebrate the 30th anniversary of the program in 2016, both the proof and uncirculated versions of the coin were issued with a plain edge and incused designation of the anniversary. In recent years, the demand for silver bullion coins has expanded considerably. The economic uncertainties experienced during the second half of 2008 led to a dramatic increase in demand for physical precious metals. The United States Mint experienced difficulty meeting the sudden higher level of demand for bullion coins. On several occasions, the Mint has been forced to suspend bullion coin sales when available inventories were exhausted. The Mint has also often resorted to imposing an allocation program, which rationed available supplies amongst authorized purchasers. Despite the suspensions and rationing, annual silver bullion coin sales achieved successive all time highs from 2008 to 2011. Annual sales records were also achieved in 2013, 2014, and 2015 when sales reached 47,000,000. The high demand for bullion coins has also had implications for collectors. The highly popular collectible proof and uncirculated versions of the Silver Eagle were canceled for 2009, as the Mint diverted all supplies of incoming silver blanks to the production of bullion coins. Following the passage of special legislation, collector versions resumed their typical availability.